While the residents of the Takae district, Higashi village and the people of Okinawa are still shaken and infuriated by the October 11 crash of a U.S military CH-53 helicopter in the district, and although the cause of the crash has not been determined, the U.S. military resumed the flight operations of the aircraft on October 18. See Kyodo News. 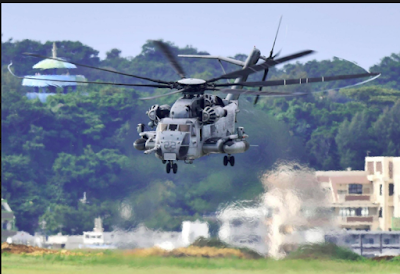 Following a 96-hour suspension of flight operations, the U.S. military’s CH-53 helicopters are back in the Okinawa sky, flying over our houses, schools, hospitals, forests and sea as if nothing has happened. The Japanese government, Okinawa prefectural government and local municipalities have demanded that the operations of the CH-53 aircraft be suspended indefinitely until the cause of the crash is determined, but to no avail. See The Japan Times. The lopsided power relationships among the U.S. military, Japan and Okinawa have prevailed again. Our lives and environment are in danger. Many of us feel we are under colonial and military occupation. Before resuming the operation of CH-53 helicopters, the U.S. military issued a media release, providing explanations for its actions. See the Media Release. In our opinion, the media release reads like a damage control PR statement, directed to (the rest of) the U.S. military and U.S. government and probably to the U.S. public, but not to the people of Okinawa (It is written in English and we have not seen a Japanese translation of it yet). Apparently, conducting “a thorough review of the maintenance records” (underline added) and fining "no issues" in the review were enough to resume CH-53 flight operations. Since we are no aviation experts, we are not in a position to make a judgment about the U.S. military’s review process or decisions per se. Still, we can point out that we have not seen any report or written document from the military's “aviation experts” substantiating what the U.S. military claims in the media release. What concerns us the most is the misleading nature of the media release. 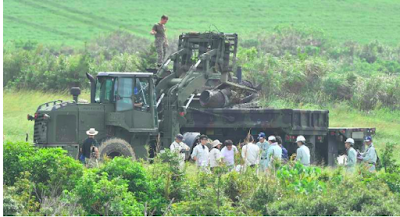 However, the Okinawa prefectural government and the Okinawa prefectural police force (and possibly the Japanese government) were all denied by the U.S. military access to the crash site to conduct investigation, apparently in accordance with the Japan-US Status of Forces Agreement, when the crash took place. See The Japan Times. It was only more than a week later the crash or after the U.S. military had salvaged the burned CH-53 and its debries and had removed away the surface soil of the crash site (without the land owner’s consent and despite the Okinawa police force’s request not to do so) that the Japanese and Okinawa governments were given access to conduct investigation. See The Okinawa Times (in Japanese). Okinawa Governor Takeshi Onaga and his prefectural government are infuriated with the way the U.S. military has been handling the case. Thus, it is hard to be convinced by the U.S. military claim that it is “working closely with Government of Japan and local officials” unless the words “working closely” now mean “forcing one's action upon someone else." And, how much information could the Okinawa prefectural governments and the prefectural police force get from their site investigation now? It is no doubt that the U.S. military is better equipped to conduct investigation on military accidents such as this case than the Japanese government, the Okinawa prefectural government and the prefectural police force are. In this regard, we hope that the U.S. military is conducting a thorough and transparent investigation on the case and will be forthcoming with the results. In Okinawa, the Japanese government has been known to withhold from the public information relating to U.S. military bases and facilities even when the U.S. military provides it. For example, the Japanese government withheld information on the deployment of MV-22 Ospreys to Okinawa and information on the flight routes of aircrafts expected to operate at a proposed military base and on the construction plan of a 214-meter wharf at in Henoko-Oura Bay, as long as it could to get what it wanted. See The Japan Times. In the past, in fact, the extent to which the Japanese government tried to withhold information was so alarming that the U.S. military claimed in a memorandum that “the JDA [Japan Defense Agency] appeared adamant that they did not want to depict flight paths over land” and that “ the US feels the need to be open with the local Okinawans because their acceptance of the plan is tied to the operational requirement of building the airfield.” See this Asia Pacific Journal: Japan Focus article. Thus, the U.S. military’s assertion that it “will continue to share information with the government of Japan as details become available” does not give assurance or comfort to the people of Okinawa. Instead, it just alarms us more. We need and welcome your support for our fight!